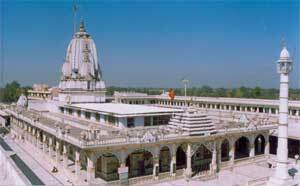 Tijara is a historical town situated 48 km north east of Alwar. Its old name was Trigartpur. Tijara fort situated on the crest of a hill has been famous for the excavation of hidden treasure recently. It was the capital of Mewat and has a long and glorious history of bravery and sacrifice. There is a popular Jain temple, visited by lakes of pilgrims every year. This entry was posted in Rajasthan, Tijara and tagged Jain temples, Tijara Jain Temples. Bookmark the permalink.